A $22 (£14) investment in the virtual currency Bitcoin four years ago has brought a Norwegian man an unexpected windfall of about $850,000. The staggering appreciation of the Bitcoin meant Kristoffer Koch, 29, was able to buy an upmarket flat in Oslo by selling a fifth of his 5,000 coins. Mr Koch, 29, said he only remembered about his investment after reading reports of the currency's rising value. The extremely volatile currency is increasingly used for web transactions. 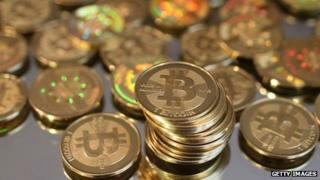 Mr Koch said that he had suddenly realised that his 5,000 Bitcoins were worth about $850,000. After cashing in the fifth of his reserves - and paying taxes - he said he was able to buy the apartment in Oslo's fashionable Toyen area. Bitcoins are stored in encrypted wallets, and Mr Koch admitted that it took him some time to remember the password to unlock the safe. "Not in my wildest dreams could I have imagined that they would have soared like this," he was quoted as saying in the Norwegian media. "It's bizarre, these psychological reflexes that make us attach a value to something that doesn't have any in itself." Mr Koch said he decided to invest in the virtual currency by doing research on encryption in 2009.